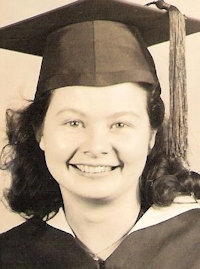 Obituary – Johnson, Dorothy Elenora (Durbin) « Perry High School Alumni Association, Inc.
﻿- intends to take up the craft of beautician following graduation. She was interested in artistic photographs and novelties during high school days. She was a candidate for band queen in 1936 and when much younger she was 8th grade queen at Henryetta. She is the daughter of Mr. and Mrs. G. C. Durbin of 713 Tenth street and was born in Beggs, Oklahoma. She worked at Smith’s Variety during during school and was a member of the Red Hots. Dorothy E. Johnson, 70, 710 Thirteenth street, died at 11:45 a.m. Saturday at St. Francis hospital at Tulsa. Funeral will be at 2 p.m. Tuesday at the First Christian church. Rev. Lynn Scott, pastor, will officiate. Burial will be at Grace Hill cemetery under direction of Brown Fhneral home. Memorials may be made to the Oklahoma Medical Research Foundation. 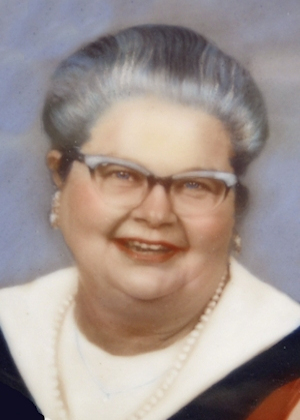 Mrs. Johnson was born at Beggs, Okla., July 4, 1920. She was the daughter of George and Ida Durbin. A resident of the Perry community since 1936, she was a graduate of Perry high school. She and Jesse Johnson were married at Perry, March 27, 1945. Mrs. Johnson was employed 12 years for TG&Y. She was a member of the First Christian church and Royal Neighbors of America. Among survivors are two sons, Jerry Johnson, West Columbia, Texas, and Larry Johnson, Broken Arrow; one daughter, Gail Ann Johnson, Tulsa; five grandchildren, five sisters, Fern Swart, Modesto, Calif.; Agatha Queen, Broken Arrow; Georgie Mae Mauney, Troutman, N.C.; Mary Lue Rupp, Perry; and Patricia Faw Faw, Stillwater.